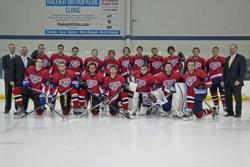 The Atlantic Coast Collegiate Hockey League is committed to providing a quality hockey environment, as part of a students overall educational experience. To ensure this the ACCHL will govern competition in a fair, safe, equitable and sportsmanlike manner. A perspective that participation in collegiate athletics will be balanced with academic and social experiences. A commitment to the highest levels of integrity and sportsmanship. A constant focus on the pursuit of excellence in both academics and athletics. An understanding of the principal that intercollegiate athletics enhances the sense of community and strengthening the identity of our elite academic universities. An inclusive culture that fosters equitable participation for student-athletes and opportunities for coaches and administrators from diverse backgrounds. A respect for the principle that what we learn and practice in a competitive sports environment today, is part of a total, life-shaping experience for our future. A respect for institutional autonomy and philosophical differences. The ACCHL is committed to bringing the most professional collegiate club hockey experience to our member teams while reducing costs and travel through innovative organization and scheduling. By structuring the league into Conferences (and Conferences into Divisions), and hosting an annual jamboree tournament in October, the teams have been able to reduce their travel costs by 8% this season, while freeing up weekends for additional non-league games or the academic or social demands of university life. Honor – Committed to the highest levels of integrity and sportsmanship. Respect – Foster an inclusive environment that respects the diverse backgrounds and cultures of our student population. Safety - To respect their opponents on and off the ice and understand that the most important aspects of their future will be experienced after graduation. Balance – To maintain a perspective that athletics will enhance the academic and social aspects of university life. Autonomy – To understand and respect the institutional and philosophical differences of our member universities.